Team Nigeria is on the verge of missing another major championships as the country’s athletes that qualified for the IAAF World Championships are yet to be issued visa by the UK Embassy. Nigeria is still ruing the inability to feature a team at the recently concluded Commonwealth Youth Games in the Bahamas after the UK and US Embassies denied the athletes transit visas. Team Nigeria was expected to depart the country on Tuesday, August 1 (yesterday) for London but could not make the trip because the athletes’ passports were still at the UK Embassy. Some of the athletes who spoke with New Telegraph said they were still at their respective bases awaiting instructions from the Athletic Federation of Nigeria on the next line of action. The athletes are scattered across various states of the federation awaiting instruction from the AFN on where and when to meet for the trip. “Three of us are still in Sagamu training hard for the competition,” quartermiler, Yinka Ajayi, said. “We don’t really know what is happening but the federation assured us that we would travel as soon as possible. Hopefully, there will be a good news today.” A coach with the national team, Kayode Yaya, expressed disappointment on the new trend by foreign countries to deny or delay issuance of visas to Nigerian athletes. He urged the Federal Government to remedy the situation before it degenerate into another thing. Yaya, who was part of the team to the 2015 African Youth Athletics Championships in Addis Ababa, Ethiopia said: “It’s becoming embarrassing and urgent step must be taken. “These are people with legitimate reasons for going to London and they are yet to get their visas. Are they going to wait till the end of the competition before they return their passports? “Some of these athletes are making their debut and if they are denied, what become of their careers? I just hope the government will do something about it immediately because the time is going. 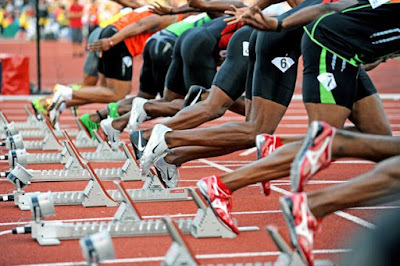 However, New Telegraph learnt that the world’s athletics governing body, the International Association of Athletics Federations, was already looking into the circumstances leading to the delay. Apart from the athletes, the officials and some accredited journalists for the competition are also still waiting for their visas with some of them applying as far back as June 6. President of AFN, Ibrahim Gusau, left Nigeria Monday night for London to enable him to attend the IAAF Congress, which will hold before the commencement of the competition.